Israel's Prime Minister Benjamin Netanyahu speaks during the 70th session of the United Nations General Assembly at U.N. headquarters, Oct. 1, 2015. Israeli Prime Minister Benjamin Netanyahu offered a blistering condemnation of the deal between Iran and major world powers aimed at curbing Tehran's nuclear program in a speech to the U.N. General Assembly Thursday in New York. In a nearly 45-minute critique of the agreement signed in Vienna in July, he accused Tehran of ramping up its arming and funding of terrorist groups, rebels and Syrian President Bashar al-Assad during the past six months – a period, he said, during which Iran was negotiating the deal with the international community and working to get sanctions lifted. Netanyahu asked what would happen then. “Unleashed and unmuzzled, Iran will go on the prowl, devouring more and more prey. In the wake of the nuclear deal, Iran is spending billions of dollars on weapons and satellites. Do you think Iran is doing that to advance peace?” he asked the audience. Netanyahu acknowledged the deal places "several constraints on Iran's nuclear program, and rightly so." But the catch, he said, is that the most important of those will be lifted no matter how Iran behaves 10 to 15 years down the road. "If you think sanctions relief and billions of dollars of contracts will turn a rapacious tiger into a kitten, think again," Netanyahu said, alluding to the fact that once international sanctions are lifted, Tehran will have billions of extra dollars in its war chest. Israel has repeatedly warned it is prepared to use military force to prevent Iran from acquiring nuclear arms. Tehran denies wanting atomic weapons. U.S. President Barack Obama's administration has vigorously defended the agreement reached with Iran in July against criticism from Republicans in Congress and Israel, describing it as the best way to avoid a new war in the Middle East. But the Israeli prime minister used evocative language and symbolic gestures to highlight accusations that Iran's leaders seek to wipe Israel off the map. He also brought attention to what he and previous Israeli leaders have called strong and persistent anti-Israel bias at the United Nations. Holding up a book by Iran's supreme leader Ayatollah Ali Khamenei, Netanyahu described it as a detailed plan for the destruction of Israel, and saying that he had vowed Israel would not exist in 25 years' time. "Seventy years after the murder of six million Jews, Iran's rulers promise to destroy my country, murder my people, and the response from this body, the response from nearly every one of the governments represented here has been absolutely nothing," he said. "Utter silence. Deafening silence," added Netanyahu, before himself falling silent for nearly a minute at the speakers’ podium. The vast General Assembly chamber was utterly quiet until he resumed speaking. "Perhaps you can understand why Israel is not joining you in celebrating this deal," he said. In a double-barreled message to Iran and the U.N., he said Tehran’s plan to destroy Israel will fail and that despite whatever resolutions “may be adopted in this building,” Israel will defend its people. "Israel will not allow Iran to break in, walk in or sneak in to the nuclear weapons club," Netanyahu vowed. “The days when the Jewish people remain passive in the face of genocidal enemies are over,” he said. Without naming countries, Netanyahu said Israel was in touch with Arab states about Iran. Diplomatic sources have said Israel and Iran's chief regional rival, Saudi Arabia, have been discussing a response to the nuclear deal and their fear that lifting sanctions would embolden a more aggressive Iranian foreign policy in the Middle East, Reuters reported. Common dangers, such as Islamic State and Iran, are bringing Israel and its Arab neighbors closer, Israel’s prime minister said. Almost as an afterthought, Netanyahu condemned Palestinian leader Mahmoud Abbas's U.N. address Wednesday as "rejectionism" of the peace process. “How can Israel make peace with a Palestinian partner who refuses to sit at the negotiating table? Israel expects the Palestinian Authority to abide by its commitments. The Palestinians should not walk away from peace," he said. Netanyahu said he is "prepared to immediately resume direct negotiations with the Palestinian Authority" without preconditions. Mahmoud Abbas, President of the State of Palestine, addresses the 70th session of the United Nations General Assembly on Sept. 30, 2015 at U.N. Headquarters. 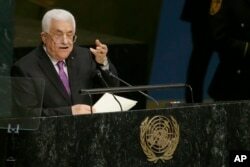 In his speech to the U.N. Wednesday, Abbas said the Palestinians are no longer bound by the two-decade-old Oslo peace agreements with Israel. He called on the world body to provide international protection for Palestinians and accused Israel of refusing to release Palestinian prisoners, while creating new Israeli settlements in the West Bank and east Jerusalem. Abbas said Palestinians could not continue to honor the 1993 peace accord and "Israel must assume fully all its responsibilities as an occupying force."